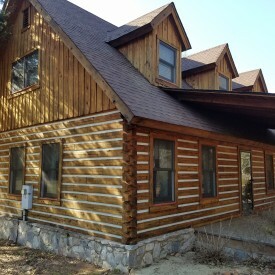 The first step in log home restoration is to clean the exterior. Ensure that you take note of all areas that might be rot or areas that contain extra moisture. Most times, once the graying and mildew have been removed, logs come out looking pretty good. It’s ideal to use a pressure washer for this process, paired with an appropriate cleaner for wood. Products with high pH (bleach and TSP) should be avoided, as well as oxalic acid. We’ve found that percarbonate cleaners works best. Your selection of pressure washer is an important part of this process. For older homes, your washer should spray about 1500 lbs psi. 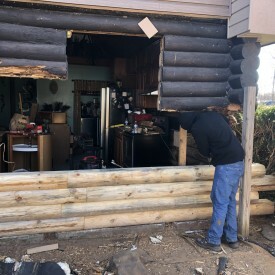 You don’t need anything more than that, as these are older homes and you can damage the wood easily. You just need enough pressure to remove the old stuff, not blow water inside and ruin your logs. Before you begin, it’s a good idea to have someone inside monitoring during the process, as water can come through cracks and corners. 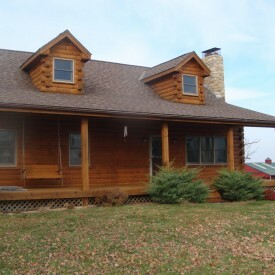 Pressure washing can cause a “fuzzing” of the logs, which can be easily remedied by sanding. Media blasting is also a successful restoration tool, albeit a bit more complicated than just pressure washing. You need a media blaster, as well as an air compressor that has the capability of putting out between 125 and 185 cubic feet/minute. Typical air compressors only produce 8-10 CFM, so you’ll need to locate a heavy duty one. It’s crucial to ensure you have the appropriate safety equipment on hand, as well as tools, and to follow the directions closely. Media blasting is not an easy process and hiring an expert may be your best option. The surface, post-blasting, will have some texture variance and a “weathered look” to it. 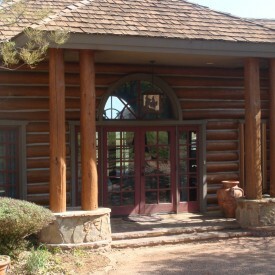 If your log home is stained,media blasting will give it a deeper color. 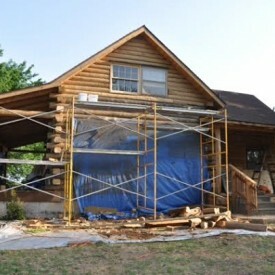 Restoring an old log cabin can be a fun and exciting task, but also have pitfalls that can be challenging to recover from. 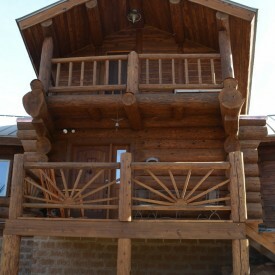 We at 888-LOG-GUYS have been restoring and repairing log homes and cabins for over 20 years. If you need expert help, give us a call!